AUSTERITY/ANTICUTS – The government says that cuts are necessary, but in fact in is just an excuse for ordinary people to pay for the inherent problems the system and the greed of a few. Austerity is unfair, unnecessary and unhelpful, and we are helping to build grassroots opposition to it. We also believe another world is possible, where each can have equal access to the resources needed to live their lives in the way they see fit. JOBS – Are you being messed around at work with your pay, conditions, terms of employment etc? Unions are supposed to help but sometimes they don’t and often they aren’t there. Anarchists believe that taking direct action on these issues ourselves can often be the most effective way of dealing with them. If you need support to help organise against any problems at work, please get in touch. How about starting a workers’ co-op? We can provide workshops explaining how to do this. It can be a much fairer way of working. HOUSING – Banks and landlords bleed money out of us for our homes, when they belong to us. People are being repossessed while thousands of houses are empty. Squatting is still legal but it has recently been made more difficult. We are campaigning to overturn this. Some look at housing co-ops as another way of getting affordable housing. Want more info or support? Get in touch! WELSH ANTIFA – Far-right groups divide our communities using racism for their own ends and we say No Way. 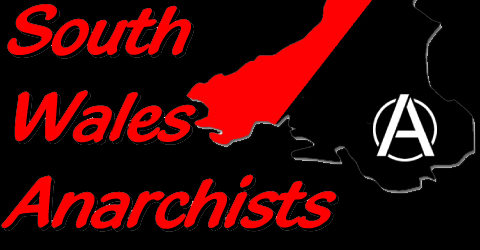 Welsh Antifa is a local group that organises by taking direct action against racism and fascism. RADICAL WALES – This is a website which has considered political analysis of Welsh politics from a wide, radical perspective, and features many anarchist contributions. FOOD NOT BOMBS – So we can fight a war but not feed the world? Food Not Bombs Cardiff is a local section of an international movement that gives out delicious free vegan grub at protests and other events. RED AND BLACK UMBRELLA – A squatted social centre in Splott that is a place to meet, eat, get info, watch films, do workshops, take classes etc. HUNGRY PLANET – A wholefood shop, bakery and cafe run by an independent collective. As well as the above, we are all often involved in Direct Action against Climate Change, the G8, Migrant Deportation, Workfare and much more! SWA meet informally every second Monday 7pm at the City Arms, Quay Street, Cardiff. Next meeting Monday 7th May. Everyone welcome.